An isolated mountain road normally used by hikers and shepherds this climb will be the crucial summit finish for the sixth stage of Paris-Nice. It’s new in a race but a gem for tourists and amateurs out training. 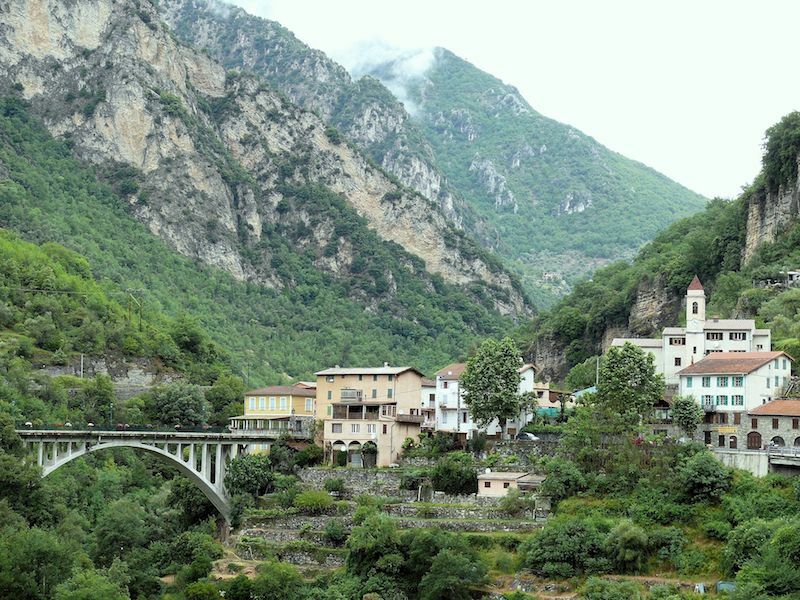 The Road: the D32 climbs west out of St Jean la Rivière in the Vésubie valley, in the Alpes-Maritimes département of France. It is 15.3km long with an average gradient of 5.7%. The Feel: there are some climbs that are an obvious destination or a natural crossing point, think of Mont Ventoux or the Stelvio. This one is neither, a road to nowhere and you could easily spend a day riding in the region, skip this climb and have still a grand day on the bike. The roads to the start are a delight as they track river gorges with the road cut into the cliff at times. St Jean la Rivière marks the start of the climb and the village name seems obvious enough given the village sits above the Vésubie river, although it could equally be St Jean le Pont for the large concrete bridge that can be seen from afar as you approach or even St Jean le Canal given an important aqueduct starts here, draining off the river to create a precious water supply for the busy coast below. If it makes you think about water then have a drink and if you need it there’s a fountain by the road just south of the bridge. The climb is impossible to miss, signs point to Utelle. Cross the bridge, turn right and the climb starts. It’s a good width with an engineered feel thanks to cuttings into the rock and wide hairpin bends. Start in an easy gear and let the effort come to you because this climb is all about pacing as it’s so regular. After four kilometres through olive groves a series of hairpins begin and they’re wide. If you want a fast time then you’ll stand on the pedals and power through the apex to take the shortest line, a technique which costs energy but delivers substantial savings compared to spinning around the outside of each bend. But slow riders get their rewards because the view of the valley below is impressive. More long sections await between hairpins until the village of Utelle arrives. It’s in the middle of nowhere but a bigger place than you’d expect with cafés, bars, inns and a church and chapel pointing to the village’s history as a place of pilgrimage and travel. Leave the village and the road changes in quality becoming rougher and narrower and about a kilometre later take the left turn signposted to the Madone d’Utelle. Here’s the hard part, the road is steeper and rougher still but it’s all a matter of degree. The black 9% slopes featured in the race profile? They weren’t there. Instead the road keeps climbing at a steady rate through past woodland of wild pines and small oaks growing amid the loose rocks which regularly fall on to the road, it’s scenic, shaded and you’re solo here with almost no traffic. As the climb isn’t that savage you have time to take in the view and note the solitude. 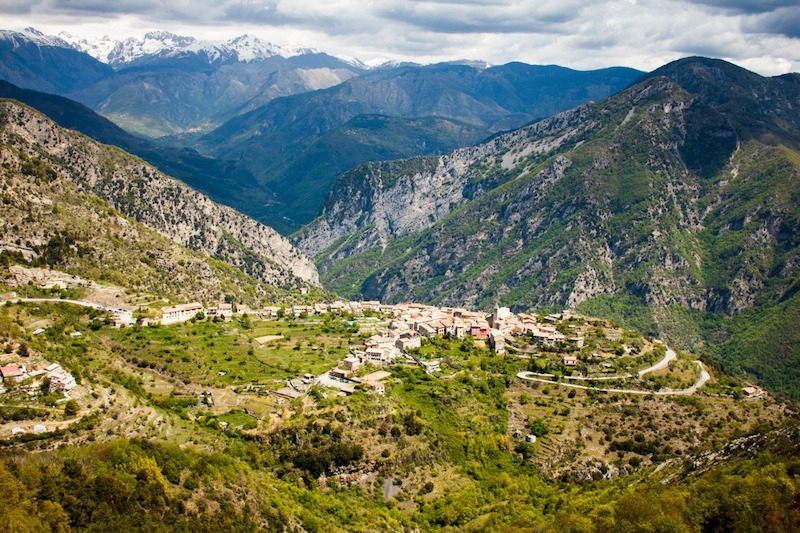 With two kilometres to go the forest gives way and the view opens up in all directions, you’re above 1,000m now and feel part of the mountains rather than the valley with the snowy peaks of the Mercantour park visible to the north and the Mediterranean sea glinting below to the south. Wolves roam here, they’ve taken sheep in recent days; maybe this isn’t the place to puncture. Press on and the ochre chapel of the Madone d’Utelle arrives in sight, the finish line for the ride. There’s no other road down so stop to enjoy the views of mountains in one direction and the sea in the other. The Verdict: ride for a day or more in the region and if you don’t manage to climb this you’ll still have had an enchanting time. 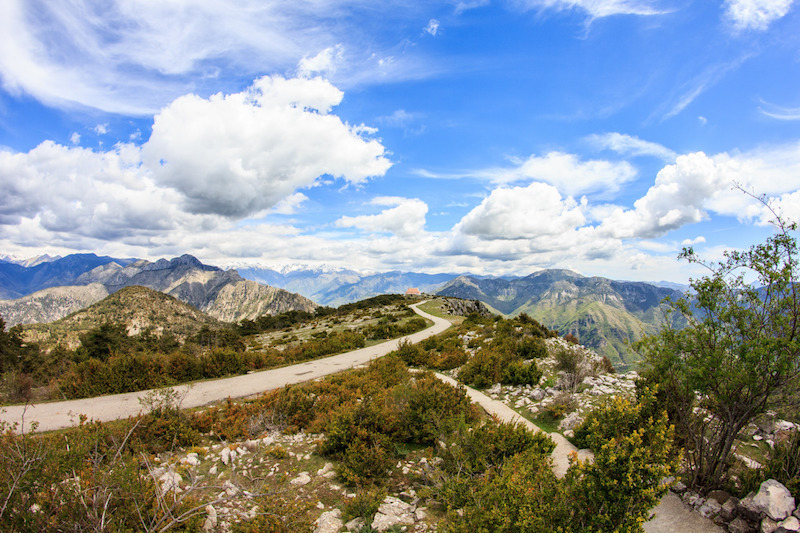 This climb just adds to it and offers fine views making it a rewarding effort. The dead end summit means cyclists get the road to themselves for most of the time. It’s also a useful test of fitness with its long and level grades. Ride: as suggested above the region is a delight to ride in, many pros live in Monaco for the tax but fiscal considerations aren’t everything, Nice has a handy airport and there’s great weather and the varied roads, all of which are ideal for visitors. As a suggestion you can start in Nice, ride towards this climb and then continue to Lantosque, take the western side of the Col de Turini and then return via various routes depending on how ambitious or tired you feel via L’Escarene, Sospel or even beyond into Italy before looping back to the start. History: a blank canvas, Paris-Nice has never visited nor has the Tour de France. 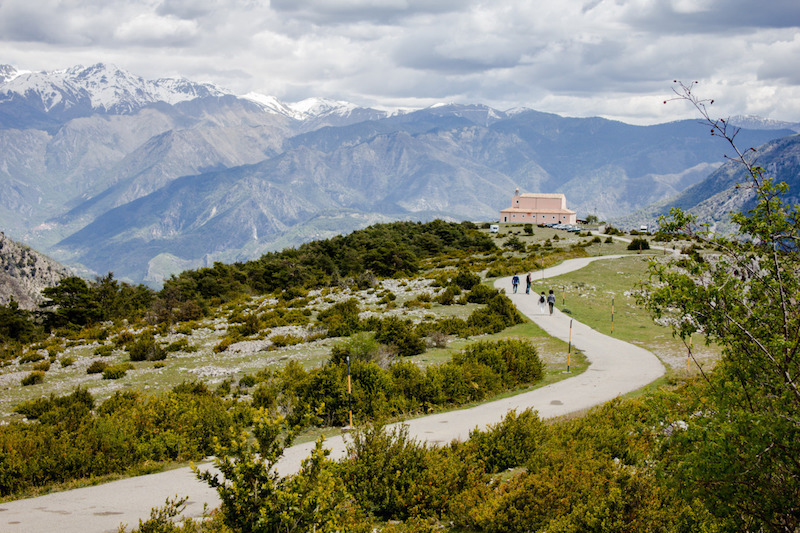 It’s a popular climb in the region, whether pro cycling’s Monaco expats or local cyclos. Away from bicycles there’s a richer history over time. Apparently a passing Roman soldier carved his name into the rock and it’s still there. Utelle has a strategic position for those approaching or leaving Nice – a local website says the name is derived from an old word meaning “eye” and hints at the view of the surrounding area. The chapel at the top, the Sanctuary of Miracles, was first built by superstitious Spanish sailors in around 850 who promised to build a shrine if they survived a storm. Paris-Nice: it’s the strategic rendez-vous of the race. The average gradient is 5.7% and once you discount the flat parts typically it’s 6-7% most of the way, selective but not savage. This is for the climbers, especially those who like steady ascensions and where being sat on a wheel is an efficient strategy given it’ll be climbed at 25km/h. The black section of the profile above is probably the best place to attack or at least thin the group down to small portions. 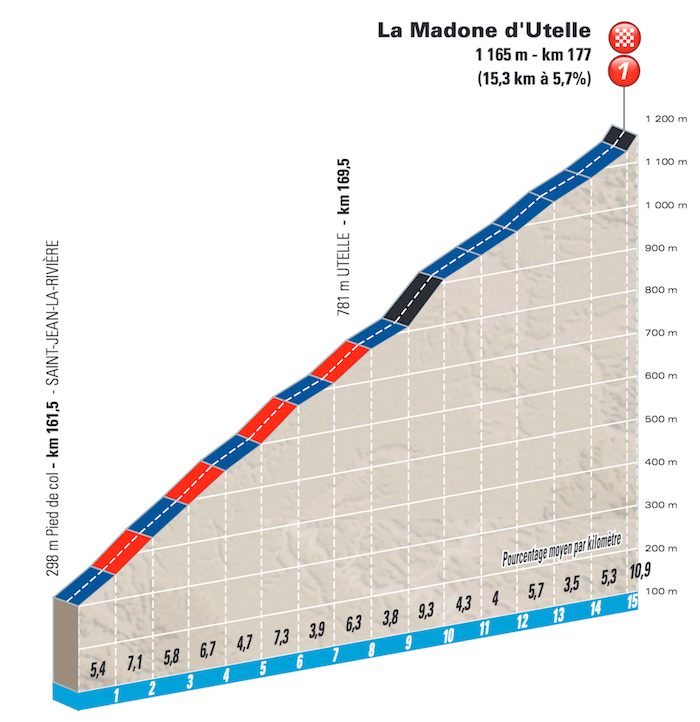 La Madone d’Utelle vs Col de La Madone: don’t confuse the two, the Col de la Madone is 25km away and a steeper and shorter effort. Travel and Access: the city of Nice is close and its airport offers connections to Europe and beyond. If you want to stay in the area Menton is a good pick because it is a scenic town but there’s plenty of choice across the region. Just do your homework, there’s a lot of crummy accommodation. If you want value, try heading across the border into Italy and as a bonus you can do the Poggio, Milan-Sanremo’s famous climb. When to visit: this region enjoys mild winters and spring conditions that equate to summer for British, Irish and Scandinavian readers. A visit in March or April is often fine and this is a part of the Alps that is not closed for winter. It is however open to tourists in July and August, the annual migration to the beaches means even the inland roads are busier but still calm compared to the sea front. Did it two summers ago. Great ride. But scorching windless dense heat, absolutely unpleasant (the fountain in Utelle was delightfully fresh, though), and the tarmac became slightly sticky. Thank God it isn’t steep. The view of Nice and the sea from the top, breathtaking. The road up the Vésubie gorges felt dangerous (and so did the descent of the Turini that I took). Fantastic area, although a bit too humid, but I don’t expect anything interesting from it at P-N.
We’re talking about March, so I don’t expect any problems with severe heat. It’s not just for tourists and amateurs — Joe Dombrowski (who spends his in-season time in Nice) recently tweeted that this is his favorite climb. Great post. You’ve sold me on it, though I usually prefer descending the other side to whatever I’ve climbed. Looking at the race profile, the P-N riders are coming from Duranus. I think that means they’ll be coming down the valley from Lantosque into St Jean la Riviere, rather than up from Nice. Is that right? From Nice as Duranus is south of St Jean, they’ll go through La Roquette and Levens before. No map but the stage profile in the piece above shows some of the places before. Did this climb out of Nice in September 2014. I enjoyed the ride along the M19 as much as the climb itself. The views of the gorge were amazing. Can’t wait for the helicopter footage when the pros ride it. For those of us who are enslaved by the evil living room couch, Google was nice enough to document the climb, and the fairytale-like Utelle thoroughly in Streetview. And now having traced my way up, I’m cooked! Time for some pasta.